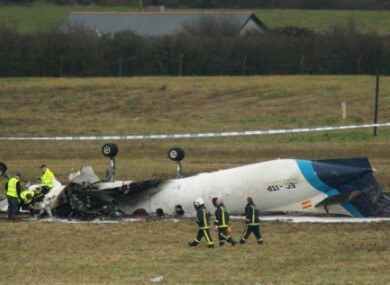 The scene of the Manx2 crash at Cork Airport on 10 February, 2011. THE FUNERALS OF two of the victims of last Thursday’s plane crash in Cork, Pat Cullinane and Brendan McAleese, will be held today. The removal of Brendan McAleese’s remains will be held on Monday shortly after noon, to reach St MacNissius’ Church, Tannaghmore, at 1pm. His widow, who is expecting the couple’s third child, has said she cannot bear to tell her two young daughters that their father has passed away, the Sunday Mirror reports. The funeral of Pat Cullinan of Cranagh, Co Tyrone, will leave his family’s home on Monday for 12pm mass at St Patrick’s Church, Cranagh. Special memorial services were held in Cork yesterday in memory of the six victims of the Manx2 plane crash at Cork Airport. One of the concelebrants at yesterday’s service was the priest who administered the last rites to the deceased on Thursday. Email “Funerals of victims of Cork plane crash to be held today”. Feedback on “Funerals of victims of Cork plane crash to be held today”.